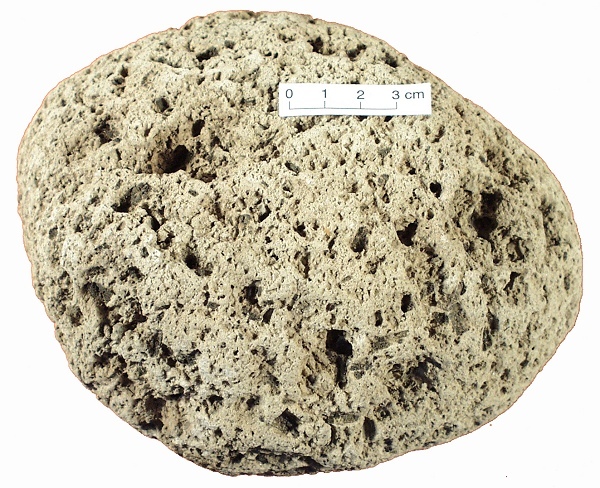 Pumice is a rock formed from a very gas-rich magma. As this magma rises in the vent of a volcano, the gas expands and forces the magma out explosively. In some cases what gets blasted out of the volcano is a froth of gas bubbles held in a relatively small amount of liquid magma. The froth freezes in the air, the liquid turning to glass and trapping the bubbles, forming lumps of pumice. Pumice is usually so light that it will float on water.